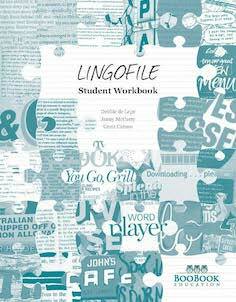 Lingofile Student Workbook-Units 3&4 $35+postage. 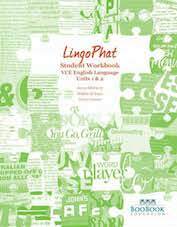 LingoPhat Student Workbook-Units 1&2 $39.95+postage. Authors Kate Burridge and Debbie de Laps. Comprehensive text books covering all topics in the study design, with activities and SAC suggestions. Order online for the best prices - $49.90 each inc GST, plus postage and handling. View sample chapters here. Package includes one exam with answer guide for Unit 1 and one exam with answer guide for Unit 2 - $120 incl GST. Full set - includes two complete exam papers with answer guides - $155 incl GST. Package includes one exam with answer guide for Unit 1 and one exam for Unit 2 with answer guide. $110 incl GST. Includes one exam paper covering Unit 3 topics, with answer guide - $95 incl GST.